The first clock radio I ever saw was one like this. It was white and rather than having light-up numbers, the numbers were on little plastic pieces that flipped over every minute/hour. My older sister owned it and of course I wanted one like it. 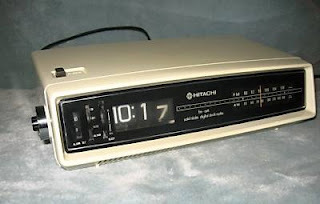 By the time I was old enough to get my own clock radio these were out of style and the new ones were out. Posted by Karen at 9:19 p.m. Funny idea for a blog ! I still have one of those and it works ! These clocks could torture with the clicking sounds they made as each minute would pass...I'm sure it turned an entire generation onto insomnia. I had one something like that when I was young. It got knocked off the night table and the numbers fell out.